High-quality motor oil is critical for maximum performance in modern two-stroke marine motors. Direct fuel injection (DFI) improves combustion efficiency, delivering the extra power enthusiasts want, while leaner gas-to-oil ratios provide the reduced exhaust emissions the government mandates. The leaner ratio leaves less oil to lubricate and protect these hotter, more powerful motors, which invites deposits and wear that threaten engine performance and life. HP Marine is proven to excel in these harsh conditions. It controls performance-robbing friction, heat and wear, yet produces low smoke and has low aquatic toxicity properties. It’s an oil as advanced as the engines it protects. The elevated heat and friction of modern two-stroke marine motors can exceed the film strength of inferior oils, increasing the likelihood of scuffing and wear. HP Marine’s exclusive synthetic formulation provides increased lubricity for reduced wear during normal and lean-mix operation (see field study results). 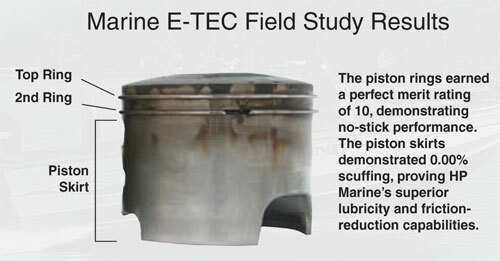 In 534 hours of field testing, HP Marine 2-Cycle Injector Oil completely prevented piston skirt and cylinder bore scuffing, demonstrating its superior lubricity and ability to reduce friction between moving parts. It maintains a strong lubricating film even in lean-mix, severe-service conditions, helping marine engines achieve maximum life. HP Marine 2-cycle injector oil is formulated with MAXDOSE™, a system of advanced additives for “super-clean” operation. It helps prevent deposits that lead to poor performance. In field testing, HP Marine inhibited ring deposits that can cause ring sticking and ring jacking (carbon build-up behind the ring, forcing it outward), a phenomenon that occurs in modern DFI outboard motors. It also virtually eliminated exhaust port deposits for reliable, efficient operation. High Performance Synthetic Marine 2-Stroke Oil was installed in a 250-hp Evinrude E-TEC engine powering a heavy-duty marine rescue vessel. Following a 28-hour break-in period at the normal oil setting, the engine was programmed to its factory-lean setting and operated for 506 hours prior to disassembly. An ASTM calibrated rater examined and awarded each component either a merit rating on a scale of 0 to 10 (with 10 representing no distress) or a percentage rating (with 0 percent representing no distress). 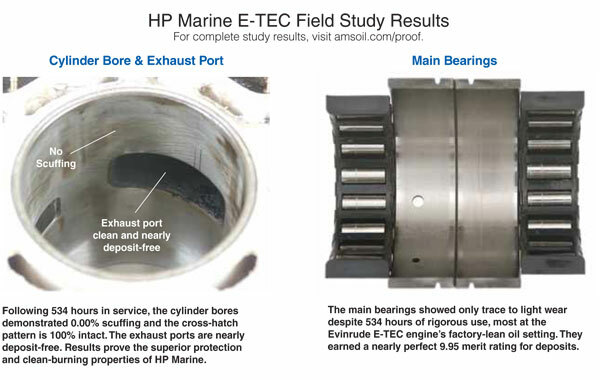 Results prove HP Marine provided exceptional wear protection and deposit control. For complete study results, visit Proof of superiority. Overview to the above link: Evinrude® E-TEC™ marine engines are unique in that they offer an alternative, lean-mix setting that allows the engine to use less oil. Whether programmed to operate at the standard mix ratio or reprogrammed to the lean-mix setting, E-TEC engines use sophisticated electronic equipment to monitor conditions, including rpm and throttle position, to determine the appropriate gas-to-oil mixture. To use the lean-mix setting, however, customers must have their engines reprogrammed by an Evinrude dealer and agree to use Evinrude XD100™ oil exclusively (Often at a higher cost compared to other oils.) Bombardier Recreational Products (BRP®), the manufacturer of Evinrude E-TEC engines, has not established a performance specification against which to qualify other oils. Basically it’s always been the desire of the staff at AMSOIL to never put out a product which could be considered 2nd best. They consistently work with suppliers using the latest trends and technology to improve the state of the art in the industry. There are no stock holders to hamper the quality of the final product. Price never makes a determination to the additives or direction used. They also constantly reverse engineer OEM products to see what they’ve been up (or haven’t) to and can assure the quality is not comparable. As a dealer attending the training events, some staff members report how far behind or even how they don’t even meet their own specifications. Of course the proof is in the performance and the AMSOIL HP Injector oil is one of those we get a LOT of in store applause. I especially remark on this product for the marine market because more so than in the automobile realm customers are pressured into using the OEM branded product. I have read in forums more times than any that boat owners are told that the OEM product such as the XD100 2-cycle oil must be used in order to protect the engine under warranty and to ensure any life there after. 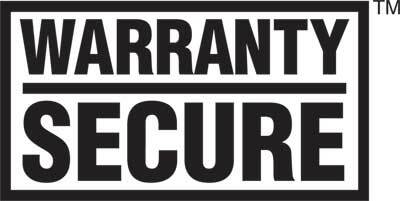 By making this demand the manufacturer is bound by law to provide that product at no charge. Yes! That is a fact and often companies have to re-issue owners manuals to correct the wording. HP Marine™ is recommended for use in all two-stroke outboard motors including, but not limited to, Johnson® and Evinrude® FICHT® & E-TEC™ (replaces XD100™ 2-Cycle Oil); Mercury® EFI & Optimax®; Yamaha®; Nissan® and Tohatsu® TLDI®; Suzuki®; Mariner® and Force®. It is also recommended for use in all two-stroke personal watercraft (PWC). Use as injection oil or as 50:1 pre-mix (2.6 oz. per U.S. gallon of gas) where NMMA TC-W3 or API TC oils are specified. Compatible with mineral and synthetic TC-W3-type two-stroke oils; however, mixing two-stroke oils should be minimized. Bought a brand new 90 HP Evinrude Etec outboard motor this year. The Evinrude dealer told me they put AmsOil Hp marine Synthetic 2-stroke oil in the motor. 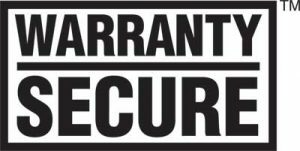 Evinrude will still cover on warranty. The dealer said it’s a lot cheaper than buying Evinrude XD100. Works GREAT! No Problems with this oil.